For years, people thought that Cloverfield would be a genuine one-off. Arriving with extreme fanfare after a trailer without even a title debuted in front of Transformers, the found-footage monster movie had a self-contained story with its own characters, arcs, and overall threat; but was enough of a success with audiences and critics that some were still tempted to wish for a sequel, perhaps exploring the origins of the very monster that ended up ripping the head off the Statue of Liberty. 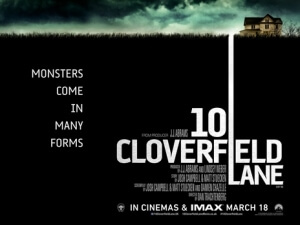 Those few will likely be disappointed with the eventual follow-up 10 Cloverfield Lane, which actually has very little connection with the previous film – but everyone else probably won’t give as much a toss, because it is a genuinely gripping and intense standalone with qualities that actually make it surpass the previous film overall. Our main hero this time round is Michelle (Mary Elizabeth Winstead), who we first see fleeing a relationship for reasons unknown, but a sudden car accident leads to her waking up in an underground bunker, at first with her leg handcuffed to a wall, but is soon unlocked by her captor Howard (John Goodman), who tells her that a chemical attack has devastated the outside atmosphere, making it impossible to breathe or survive. The only other person in the bunker is farm boy Emmett (John Gallagher, Jr.), who adds fuel to Howard’s crazy theory, but Michelle remains unconvinced, and resolves to eventually escape Howard and his increasingly frightening nature – but what if it turns out he’s right, and the world really has gone to the pits? That’s the main question being asked here, made even more uncertain by the fact that the very person both Michelle and Emmett are with might be just as dangerous as the outside, if not more so. It’s a dilemma made plausible and believable through a tight script by Josh Campbell and Matt Stuecken, with rewrites credited to Whiplash writer-director Damien Chazelle, which explores the very nature of a different kind of monster, one that doesn’t necessarily decimate the entirety of New York in its path. Through clever dialogue that lays out characters’ true perspectives – one character’s underlying misogyny is revealed in a game of charades – and also little things within the body of conversation that make them feel more human and three-dimensional, we are allowed to not only root for the people we’re meant to be rooting for, but also properly fear exactly who we’re meant to be afraid of. But maybe that’s because John Goodman is such a terrifying presence in this movie – perhaps the scariest he’s been in a film since maybe Barton Fink – that he will cause anyone to shiver with fear or, in more extreme cases, gently soil themselves just by his character leering over others. Goodman, a highly regarded character actor, is truly on top form here in perhaps his most rounded and outstanding performance in years, one that will surely make J.K. Simmons’ character from Whiplash seem less scary by comparison; there’s something about Howard’s unhinged nature when we first meet him onwards that’s instantly unsettling, and as the film goes on we are given more and more reason to be properly frightened of this crazy, even dangerous, lunatic, but while the character is written well it really is Goodman who brings the horror figure to life. Winstead and Gallagher, Jr. are also really good in this film, but whenever their co-star is on-screen it’s clear who steals the spotlight out of all of them. It’s way too early to tell if this performance can even score Goodman the first Oscar nod of his career – a shock to many of you, we’re sure – but if the Academy can remember past early-year contenders like The Grand Budapest Hotel or Ex Machina, then we have no reason to doubt they can at least consider him for what is a genuinely terrifying performance from an increasingly underrated actor. It should also prove to be a strong calling card for first-time director Dan Trachtenberg – best known for his attention-grabbing fan short Portal: No Escape – who brings a real sense of claustrophobia to this confined space we are trapped in for the majority of the film, one made even more unbearable by the very presence of a madman like Goodman’s Howard. Every scene has something to grab our attention, and as the film progresses in its own mystery we get more and more invested in wanting our lead to overcome the wrath of her captor, and for things to work out well for them in the end. It’s such a well-directed movie, with strong performances and a tight script, that you’re way more invested in these people and these events than a bunch of twenty-somethings running around a city during a monster attack, all while filming every little thing. Speaking of Cloverfield, we should probably emphasise further that this movie, despite sharing the name as well as producer J.J. Abrams, bares absolutely no relation to that film whatsoever. The direction they seem to be going in, especially within the action-packed climax, seems to be that of an anthology film series, like a feature-length Twilight Zone; and if that means different casts and crews working on different ideas that might even surpass even 10 Cloverfield Lane, then we’re so down for that. However, that might be slightly difficult; they might have already peaked with only the second entry. 10 Cloverfield Lane may not have many connections to the previous Cloverfield film, but it’s an intense and well-made standalone that excels from a tight script, strong performances (especially John Goodman), and solid direction that can make it all seem more terrifying than most of the actual horror films out there.